EN: 2018. Canvas collage of recycled paintings, originally made with cyanotypes, solarfast prints, monotypes and screen prints of microscopic, macroscopic and aerial images of minerals, brain imagery (the human cerebellum, rat neurons…). Japanese washi paper, mineral pigments from France and Italy, and linseed oil on canvas. 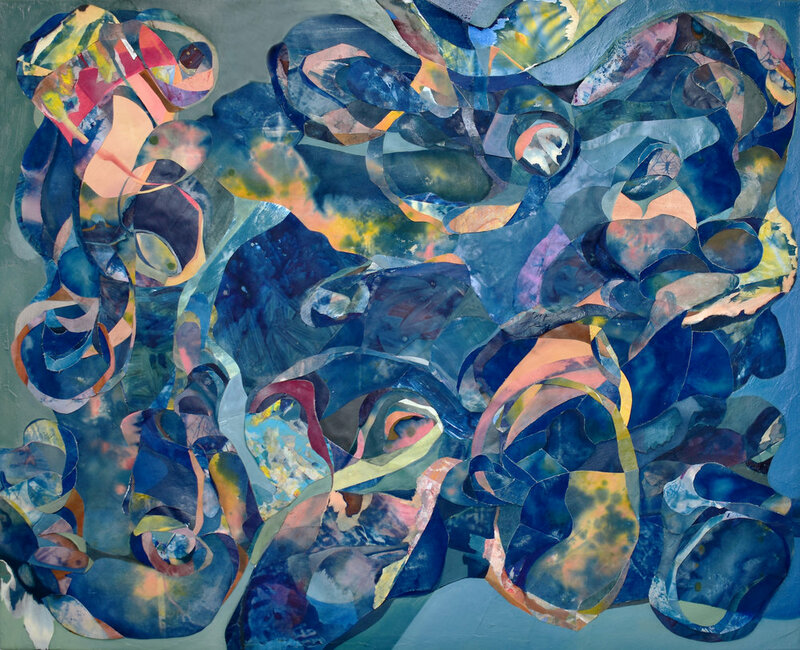 66.9” x 53.1” (170cm x 135cm). Composition based on microscopic images and scientific models of geomorphological phenomena. FR : 2018. Cyanotypes et tirages solarfast à motif des images microscopiques, macroscopiques et aériennes de minéraux et synapses cérébrales. Tableaux récy-clés, monotypes, papier japonais washi, pigments minéraux provenant de la terre française et italienne et huile de lin sur toile. 170cm x 140cm. Composition conçue à partir des images microscopiques et schémas scientifiques des phénomènes géomorphologiques. 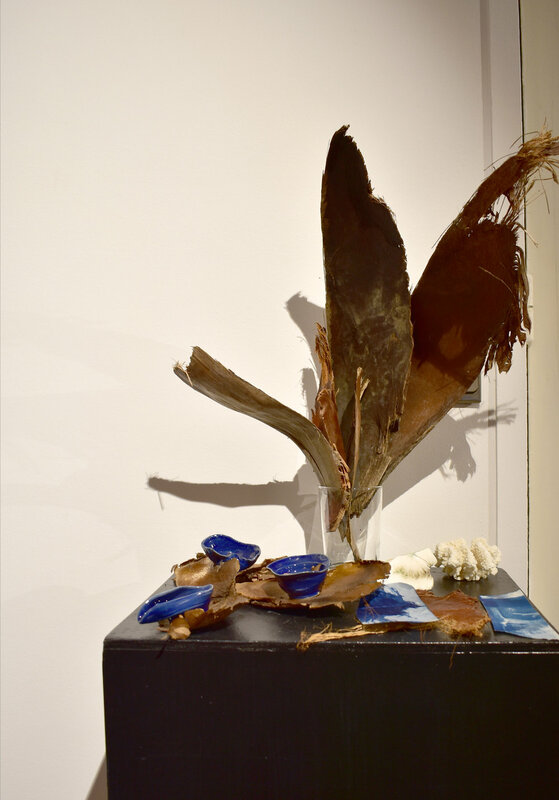 Unfurled as a floor installation under plexiglass, along with Looped (left) and Study for Unfurled (right) and Altar for Unfurled : revealing the natural materials (palm tree bark, platycerium leaves, Icelandic rock, hand-made ceramic vessels, cyanotypes of the human cerebellum) that inspired/generated the painting. 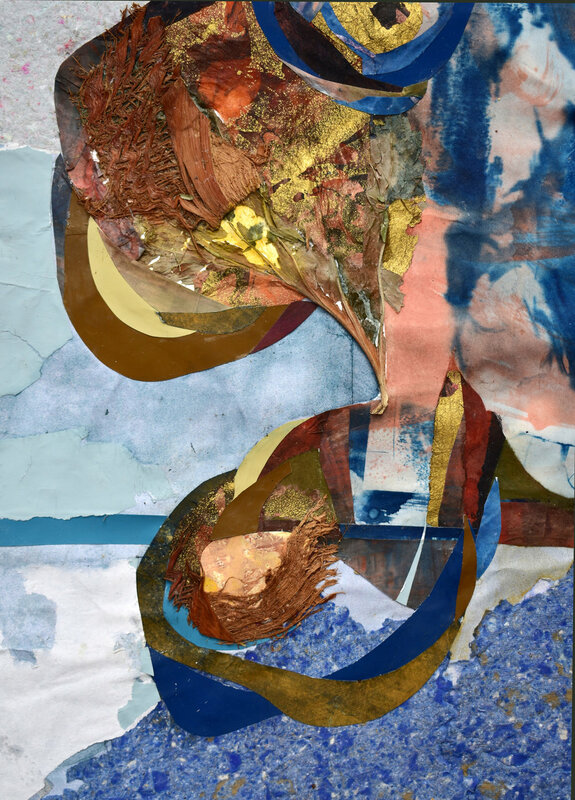 The choice of a floor composition presents the three works as a continuous, cyclical whole— a stage in the process of recycling paintings and natural materials. Floor composition inspired by Italian mineral marqueterie. EN: 2018. Collage composed of preserved cactus skeletons and palm tree bark collected in Sicily, Mallorca and New Orleans, Parisian preserved leaves and metro posters, hand-made and dyed recycled paper, marbled paper, cyanotypes, anthotypes, chlorophyll prints, and screen prints of the human cerebellum superposed with an aerial photograph of pollution produced by the Rio Tinto mine, Spain (courtesy J Henry Fair ). Paint using Japanese iwa enogu (crushed glass) pigments, French and Italian natural pigments, and linseed oil on paper. 19.3’’ x 31.1’’ (49cm x 79cm). Private collection, Dallas, TX. FR : Étude pour Unfurled, 2018. Squelettes de cactus et écorces de palmier collectionnées en Sicile, Mallorque et Nouvelle Orléans, feuilles, affiches de métro, papier recyclé fabriqué à la main, papier marbré, cyanotypes, anthotypes, tirages à chlorophylle, sérigraphies du cervelet humain, pigments organiques provenant du Japon et de l’Italie, huile de lin sur papier. 49cm x 79cm. Collection privée, Dallas, Texas, États-Unis. Altar for Unfurled. 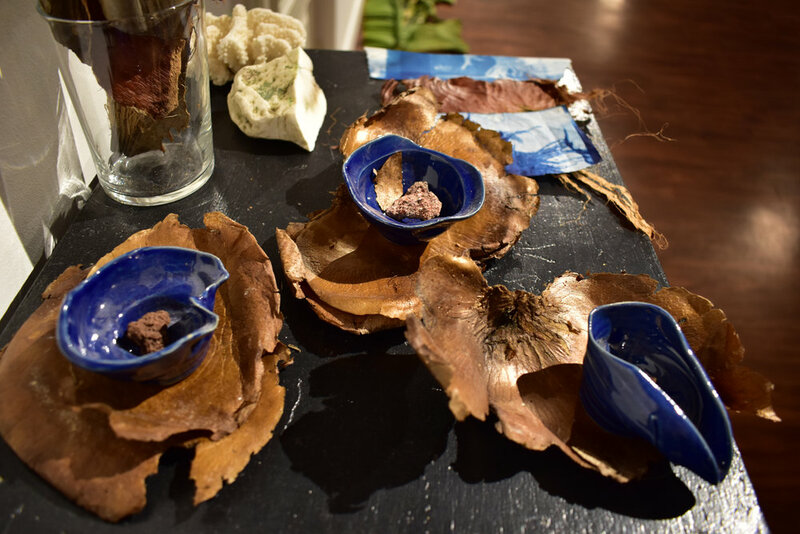 Elements incorporated into the composition of Study for Unfurled: Hand-made ceramic vessels, sulfur, basalt and scolocite rocks collected in Iceland. Coral from Portugal, platycerium bark (Jardin des Plantes, Paris), palm tree bark (Mallorca, Palermo, New Orleans), cyanotype scraps made from microscopic imagery of the human cerebellum.